If you need to ship your product or transport it a long distance, prepare it for transportation as follows. 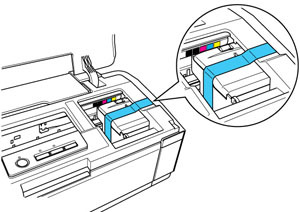 Open the printer cover and check that the ink cartridge holder is all the way to the right (the home position). If necessary, plug in and turn on the product, then turn it off again using the power button after the ink cartridge holder is in the home position. Fasten the ink cartridge holder to the case using tape. Leave the ink cartridges installed to avoid damaging the product. Note: Some tape may be difficult to remove if left in place for a long time. Remove the tape immediately after transporting the product. 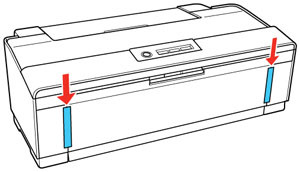 Close the printer cover and output tray, then secure both sides of the output tray to the outer case with tape as shown. Pack the product in its original box or one of a similar size using the protective materials that came with it. Keep the product level during transportation; otherwise the ink may leak. After unpacking the product, remove the tape securing the ink cartridge holder and output tray. If print quality has declined when you print again in a new location, clean and align the print head.